At re:Invent, customers made it clear just how significant a programmable software model is to the future of the contact center. I quickly discovered that the official industry analyst summit wasn’t the place to get the contact center information I craved. On day two, I set out to hop around the seven-casino event campus to attend breakout sessions dedicated to Amazon Connect. In the first session I attended, “Customizing Your Amazon Connect Contact Center,” axialHealthCare and Rackspace, each with custom customer relationship management (CRM) systems, described how they’ve used Amazon Connect to replace premises-based contact center solutions. For each, the reason for the change was clear: While the legacy systems could be made to work with custom CRMs, the time and cost required wasn’t justified on aged systems. I had my first a-ha! moment during that session. When it was his turn to present, Kevin Harvey, VP of engineering at axialHealthcare, showed a slide (below) -- of code. It brought to mind a similar screen I saw last February during a pre-briefing on Twilio’s impending Flex contact center announcement. I remember telling Al Cook, GM of Twilio Flex, “contact center people don’t want to see code.” I may even have put my hands over my eyes and told Al to make it go away. With this comment, it occurred to me that the journey that began with the digitization of voice in digital PBXs in the 1980s to a pure software model appears to be nearing completion. The Amazon Connect customer reflection reminded me of a comment from Twilio CEO Jeff Lawson at the company’s Signal customer and partner event in October. 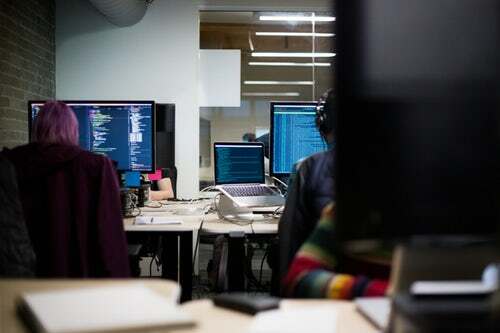 With its application platform -- the underpinning of Flex -- Twilio is developing a new way to create software, Lawson posited. Last week as I listened to Amazon Connect customers, in that first session and two others, I realized that Amazon Connect is more like Twilio Flex, a build-your-own contact center, than I had first imagined. Hearing them talk about their use of Amazon Connect made it clear that a large part of the appeal isn’t just about using a cloud contact center solution, but entree into a world where every AWS service released becomes a potential Amazon Connect capability. At Enterprise Connect 2018, Collin Davis, AWS GM for Alexa for Business, talked about and demonstrated how Amazon Lex works with Amazon Connect. 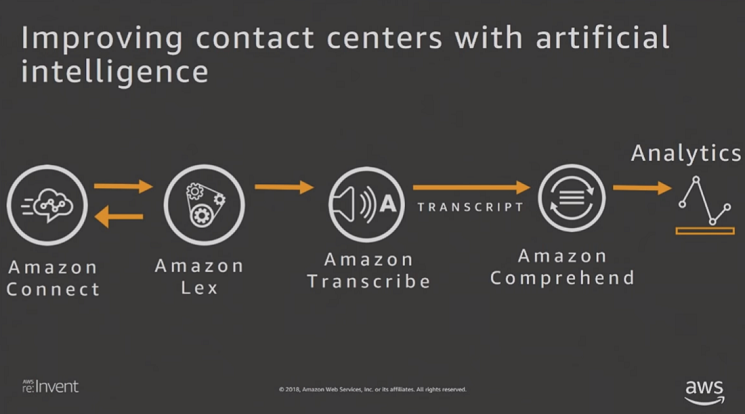 In another re:Invent session, “Bring the Power of AI to Your Amazon Connect Contact Center,” Liberty Mutual and several other Amazon Connect customers talked about using Lex, as well as Amazon Transcribe and Amazon Comprehend -- all services that turn spoken contact center calls into data that can feed into analytics engines, as shown in the slide below from Liberty Mutual, and ultimately become actionable. In my briefings with Amazon Connect GM Pasquale DeMaio, I heard the message loud and clear: The Connect platform is designed to be open. 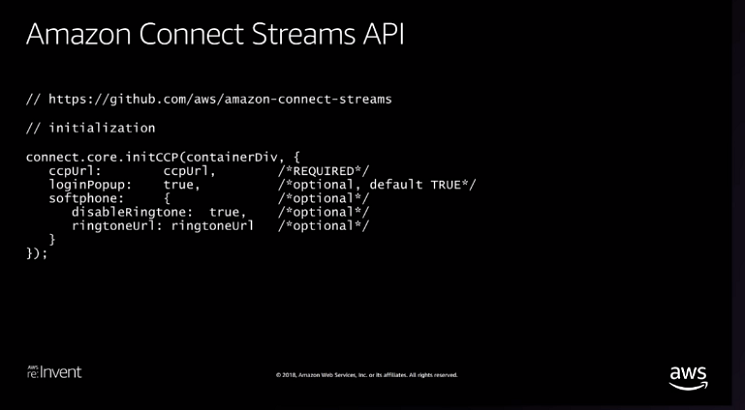 So while AWS may offer specific services, if a customer wants to use different tools, Connect allows them to do so. The number of technology partners, especially workforce optimization companies, that I saw in the same Amazon Connect sessions I attended attests to the platform’s openness. In 2018, developers began taking center stage in key contact center deployments, using platforms from companies such as Amazon, Twilio, and Vonage Nexmo. At Enterprise Connect 2019, coming March 18 to 21 in Orlando, Fla., we’ll explore this topic in the session, "The New Role of the Developer in the Contact Center." Join us to learn more about how to approach this new generation of contact center platform, as well as how to test and maintain applications built with it. We’ll get as technical as you’d like… though I might be tempted to cover my eyes. As a No Jitter reader, you can save $200 off the price of Enterprise Connect 2019 by entering the code NJPOSTS. Register now!